The density of fresh water is 62.29 pounds weight per cubic foot at 68oF, or 998.2 kilos per cubic meter at 20oC. The density of surface sea water averages 64.08 pounds weight per cubic foot or 1,027 kilos per cubic meter. Click to calculate density based on salinity & temperature. Formulas below are only approximations, and are called the "linear" theory of waves. More precise formulas require more math, and are covered in the US Army Corps of Engineers manual cited at the bottom. Note this means energy per unit area depends only on height, not speed or wave length. This is 251 foot-pound-force (or 340 joules) per square foot for a 1-foot high wave. Gasoline energy. In gas-powered boats, the wave energy comes from the gasoline. Gasoline has an energy of about 130,000,000 joules per gallon (source 1, 2, 3), so if the engine operates at 10% efficiency, each gallon creates 38,000 square feet of 1-foot high wake or 153,000 square feet of 6-inch high waves. A boat going 2 miles per gallon (10,560 ft) would create wave areas (total of 2 sides) 4' wide and 1' high or 15' wide and 6" high. Boats actually create a range of wave heights, so these areas give only an indication of the disturbed area. Many boats, which achieve less than 2 miles per gallon, create wider or higher wakes than that. In any case the disturbance travels outward in a V behind the boat, and eventually transfers this energy to the shore (conservation of energy). Diesel engines derive about 50% more energy per gallon of fuel than gasoline engines (more energy in the fuel per gallon, & more efficient operation), so they create about 50% more wake per gallon. The difficulty in converting this energy or size of wake into erosion is knowing how much energy (or power, see below) it takes to break the bonds holding soil particles to each other and to the roots of vegetation. The estimates on this website for erosion per gallon of gas are based on observed erosion per boat passage and estimated gas consumption per hour, for various boats and speeds. They give an order of magnitude and show a range for different conditions. Wave Power. Arguably the erosive force is related less to the energy, and more to the power, which is work done per unit of time, or work times velocity. Bradbury points out tides have great energy but little power and less erosive force than waves (email). Maryland summed the energy from all measurable waves coming from one wake, as these passed the wave gauge, to find total energy from a wake. The study subtracted wind waves' energy from total observed wave energy during the arrival of a wake, to have a pure measure of wake energy (Zabawa p. 7-4). They said they used the following formula, which omits g, as already noted. On p.8-6 they use this same expression for both the average energy per square foot of surface area, and for total energy in a wake, which is a typographical error, since total energy is bigger than the average energy per square foot. They do provide tables showing average and total wave energy, and the total is 9 to 15 times the average (pp.8-8, 8-9). Also, they say specific gravity, not density, but they give the figure of 62.5 lbs/ft3 which is density, while specific gravity of water is one, which would not add much to the formula. Wave length is given below as wave period x wave speed (i.e.time between crests). On an approximately vertical shore like a sea wall, much of the wave energy may be reflected and not dissipated on the shore. On a gently sloping shore like a beach, most energy is dissipated when the wave breaks. Long low waves break when depth decreases to 1.1 to 1.5 times wave height. Short waves break far from shore, because they are barely stable to begin with (Sverdrup p. 537). On a high friction shore, like a marsh or thick beds of sea grass reaching the surface, some energy is dissipated as heat in bending the vegetation, and the wave may attenuate without breaking. Doctors (p. 32) says for waves of the same height, waves with longer periods are more erosive than shorter periods. If this means an individual long wave is more erosive than an individual short wave, the difference can be attributed to a larger area in the longer wave, and is consistent with the US Army, Sverdrup & Maryland formulas that energy is constant per unit area, for given height, regardless of wave length, period, or speed. If Doctors means 20 minutes of long waves are more erosive than 20 minutes of short waves of the same height, that would conflict with the formula, since the number of square feet arriving on shore in 20 minutes depends only on the wave speed, which depends only on water depth, not wave period. One can also think of erosion in terms of particle speeds, under that heading below. Nanson et al. (p.1) say the number of wave impacts also determines the amount of erosion. It is not clear if this means holding other factors constant, such as the total energy. Gadd (p.53) says wave heights rise with square of boat speed, up to length Froude numbers of 0.5-0.6 and then decrease. Maryland (in shallow water) says wave heights rise with boat speed, up to depth Froude numbers of 0.7 to 1, then decrease. However total energy of all waves in a wake was more closely related to absolute boat speed than to depth Froude number. These two Froude numbers are both significant; wave height depends on both water depth and boat length. Cox also says height & energy of wakes are related to the ratio of boat weight (called displacement in boats) to boat length. Antrim and Winters describe the relation among wave length, wakes, and resistance for small boats (hull speed). When a boat goes slowly, the bow moves water up, then down (in a bow wave), and in the natural circle of water particles in waves, the wave rises again partly back along the hull, and there are easily visible ripples down the side of the boat. When the boat is slow, the ripples are not large, and the boat does not need much energy to go forward. As the boat goes faster, it goes forward farther before the water particles rise again, and they may rise only at the middle of the boat (wave length = half of boat length) or at the stern (wave length = boat length). Wave height and resistance increase greatly at this last speed, when wave length equals boat length (bow is at one crest and stern at another, called "hull speed"). It takes large energy and creates large wakes for the boat to go faster through the water. Large boats, even narrow ones, can go significantly faster through the water only with very powerful engines (like destroyers). Bulbous bows are designed to move the water aside in a more complex way, wasting less energy by creating smaller bow waves (and wakes) at a given speed. The standard explanation is that they create a small bow wave farther forward than the primary bow wave. This wave from the bulb, at cruising speed, has a trough near the peak of the primary bow wave, reducing wave height, wave energy, and fuel used, for a given speed. However the primary bow wave exists because it contains water which has been pushed out of the way of the boat. Even with the bulb, water still needs to be pushed out of the way, and a fuller explanation is needed. One naval architect believes the bulbous bow rises less, the stern sinks less, so less water is pushed out of the way. Besides reducing fuel cost and wake damage, another side benefit is less pitching and a smoother ride. He has pictures here and here,. 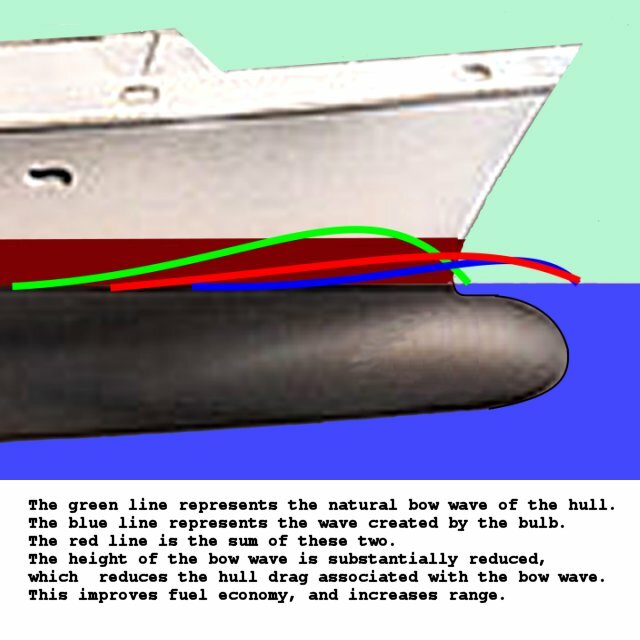 Others say bulbs do not reduce pitching and do not hold the bow down, point to the extra length of the ship and extra forward buoyancy, allowing a sharper bow.. (Wikipedia says the bulb's bluntness makes the bow wave start farther forward of the boat, which would also make the bow wave lower. It says bulbs started with a 1910 warship and some 1920s passenger liners.). A discussion says bulbs reduce pitching in catamarans, which already have such low resistance they do not need the wave-canceling effect. A military site has a diagram of the wave-canceling effect. The diagram may be accurate in three dimensions, though it does not appear to show an accurate addition of the wave curves in the two-dimensions of the image. Gadd (p.49) says that slow or long boats (length Froude number less than 0.5), create small waves in deep water; biggest waves when water is shallow enough relative to speed, so depth Froude number = 1, or boat speed = wave speed; and then smaller waves again when the water is yet shallower. Gadd (p.49) also says for fast or short boats (where length Froude number > 1) depth affects wave size much less. Gadd (p.51) says short boats are less affected by depth Froude number, because they create shorter wave lengths, which are less affected by depth. Wave height (with propulsive & erosive energy) also depends on hull shape. Modern commercial hulls are all designed for low wakes (to save fuel cost) along with stability. The sharp narrow hulls and round bottoms of racing shells, canoes and catamarans have the least wakes for the load they carry. However catamarans create waves with longer periods, which increase erosion, so the net effect is unknown (Doctors p. 32). Click for Examples of Wave Speeds, Heights, Lengths, Decay, etc. 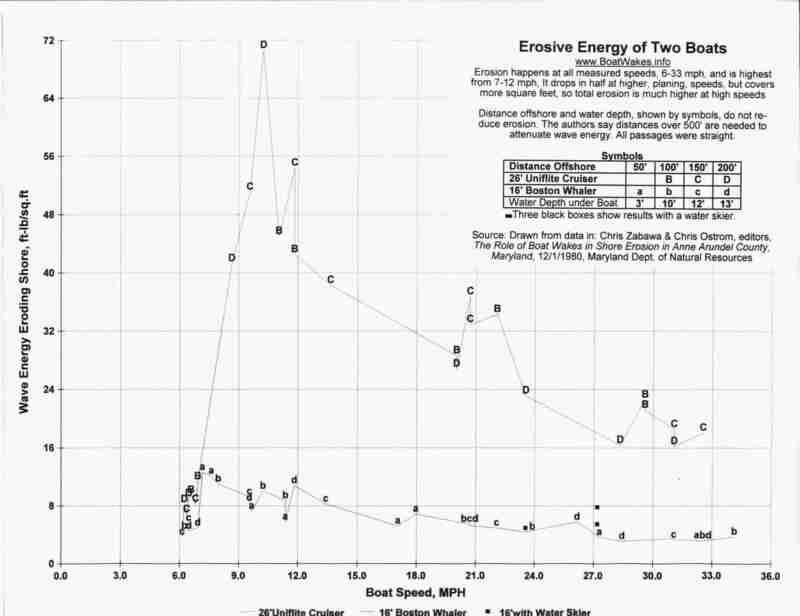 Maryland's studies show that maximum wave height does decrease with distance from the boat's path, but energy does not. Doctors shows total calculated wave energy (sum of squares of heights) is constant in the full range where it was estimated (up to 1,300 feet or 400 meters from the boat's path, bottom line of graphs on p.30 of his paper). A decrease in wave height is not necessarily a decrease in erosive energy, because the largest wave may be transferring its energy to adjacent waves. Energy is conserved, and is only lost by slight friction in the water, with the air, and ultimately against the shore. It is well known that waves from storms in the open ocean travel for thousands of miles without totally decaying until they reach shore. Nanson et al. (p.12) found that among the simplified variables which they tried, the best correlation to erosion was found with the total power of the biggest third of waves in each wake, 93%. They did not measure correlation with total energy of all waves in a wake. The correlation of erosion with height of the biggest wave was 73% (not statistically significant difference from the 93% found with total power of the biggest third., for their sample size). It is possible that waves below a certain size do not disturb the internal bonds of shore sediments, so they would not cause erosion. However the water table continues into the ground, so sediments on the water's edge are surrounded by water, and it does not take much energy to disturb them. Garrad & Hey found that 4 of 7 boats tested did stir up sediment when operating at less than 2 mph. Theory (Stoker p.242) and observations (Cox p. 31) say the maximum height of waves in a wake decreases in proportion to the cube root of distance from the boat. For example the height of the largest wave decreases by half when distance increases 8-fold. In the graph here, heights decrease by half when waves go from 20 to 160 feet from the boat. They would drop another half only when they reach 1,280 feet from the boat (1/4 mile). Cox (p.32) says the decrease in height of the highest wave may be slightly more pronounced in shallow water (distance-0.4). Doctors (p.31) calculates theoretical decreases of distance-0.5 for large ferries (60 tons) at high speed (over 25 knots). Gadd (p.53) says wave heights from high speed boats, at large distances from the boat, decrease faster (distance-0.5 not distance-0.33), but the number of waves increases proportionate to distance1, and the waves will aim more at the bank, rather than along it, with long crests which may set up resonant swaying of any floating reed mats at the shore (p.49), all of which counteract the reduced wave height and cause more erosion. Gadd (p.54) also identifies a deep trough accompanying boats in shallow water, and extending only about a boat length on either side, where the boat displaces water, and this trough can be very erosive. Payne & Hey (p.19) add that there is a slow rise in water in front of a boat. Both the rise and the trough are more pronounced in a small channel, where there is little room for the water to move out of the way. Das & Johnson, reported in Nanson et al. (p.3), found that wakes from small fast boats decay faster than wakes from large boats. Click for table showing distances off shore cited by different authorities. Speed of a wave traveling through water depends on its length (crest to crest, shorter waves go slower) and/or water depth (waves go slower in shallows). Note the height of the wave (trough to crest) does not affect wave speed. The general formula is below (US Army equation II-1-8 & p. II-1-31, and http://www.antrimdesign.com/articles/waves.html). [wave speed] ~ square root of (g[water depth]) in very shallow water. Here "deep water" means depth is more than half the wave length; at that point the TANH function is .9964, and in deeper water it gets even closer to 1. Shallow water means depth is less than a 20th of the wave length (Antrim, US Army table II-1-1. However US Army also uses the figure 1/25th (items m & n, pages II-1-8 & 9). In a steady state, where waves come from directly offshore onto a sloped shore, the energy leaving deep water equals the energy arriving at any particular depth of water, closer to shore, so we can set the power in deep water equal to the power in shallow water. Since wave period is constant, and speed is a known function of depth and wave length, the equation can be solved to see how waves get higher and slower as they reach shallows. Each water particle travels in approximately a circular path as the wave goes by: rising, then going forward as the crest passes, dropping, then going backward as the trough passes, to end in nearly the same place as before. Amplitude, used in the formulas below, is half the wave height, since it is measured from the midpoint, the level of the water if it were ever at rest. Payne & Hey (p.17) give this same formula without the "e" term, explaining that in each wave period, a particle travels the circumference of a circle whose diameter is wave height, so particle speed is circumference divided by period. This makes sense, but gives much smaller results than US Army formula with the "e" term. If we multiply Tricker's version of the shallow water formula above by the "e" factor which the US Army uses for deep water, Tricker's results closely match results from the more complex US Army calculation for all depths down to a foot of water. Calculations of all these formulas for a range of depths and wave lengths are here for comparisons. It may seem strange that bigger wave speeds give smaller particle speeds, but remember that faster waves have long periods and deeper water, which makes the relationship more understandable. In shallow water Stoker (p.243) says that the angle is larger when boat speed is less than wave speed, and that the transverse waves disappear when boat speed is greater than wave speed. The period is the time taken for one complete wave to pass a point, crest to crest or trough to trough. Cox says periods are related to 1/boat length, which seems a typo; larger boats should have longer period waves. Gadd (p.51) says wave length is generally less than 3 x boat length. Since period is proportional to wave length in shallow water, where wave speed is dependent only on depth, period is therefore also proportional to boat length. Assuming as above that the transverse wave length is less than 3 x boat length, Gadd solves for 2pi[boat speed]2 /g < 3[boat length] and finds that length Froude number < 0.7 so transverse waves disappear when speeds are above this length Froude number (examples include 7 mph for a 7 foot boat, 14 mph for a 25 foot boat). Yih (p. 22) says transverse waves disappear for depth Froude numbers over 1 in shallow water, because the wave speed cannot exceed the square root of g[water depth], so waves cannot keep up with a boat going faster than that. Robert. J. Byrne, and Gary. L. Anderson, Shoreline Erosion in Tidewater Virginia, 1976, Virginia Institute of Marine Science (VIMS), Chesapeake Research Consortium Report No. 8, Special Report in Applied Marine Science and Ocean Engineering (SRAMSOE) No. 111. J. M. Dorava, and G. W. Moore, Effects of boatwakes on streambank erosion, Kenai River, Alaska, 1997, U.S. Geological Survey Water-Resources Investigations Report 97-4105, 84 p.